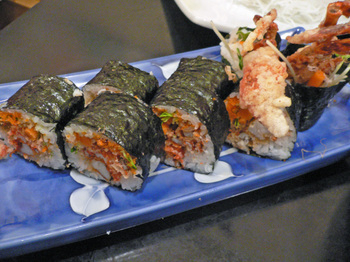 5 Days of Feasting Day 3 - Road Trip, Sushi Komasa (LA) - mmm-yoso!!! After two pretty good meals at China Max and Izakaya Sakura, the Missus decided that she still wanted some sushi from Her favorite little restaurant in Little Tokyo, Sushi Komasa. My original post on Sushi Komasa was done way back on May 27th of last year. As a matter of fact, it was my second post. Since much is still the same, I'll try to spare you most of the details. One of the really good things about Sushi Komasa is the late closing time of 11pm. A word of caution though, we've found that an 11pm closing time means an 11pm closing time. On many occasions the last seating will take place at about 1020pm or so, after which the closed sign will be posted, and "Komasa" will be "turned off". Tonight the Albacore was among the best I've had here. So very moist, and meaty. Most delici-yoso!!! The Missus kept looking at the slices of Albacore going, "look at how juicy it is, look at how moist it is". Geeez, sometimes I just can't take Her anywhere! Komasa also dishes up consistently good Ankimo, though not on the menu, it is usually available. 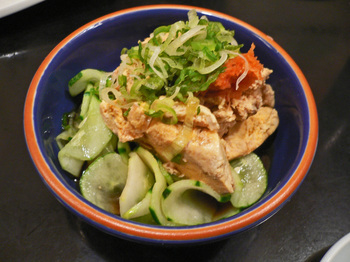 Tonight's version was oh so very rich and creamy, and the ponzu and cucumbers helped to cut the richness. Of course we get a variety of Nigiri sushi(most priced around $3.80). Let's see, on this evening we had 4 orders Albacore(for who else??? ), 2 order Hamachi(yellowtail), 2 orders Maguro(tuna), 2 orders Hirame(flounder), and 1 order Tai(snapper). As we hand over our sushi order, we usually get, the "I think this is too much", comment. To which our response is, "don't worry, we're hungry".......... And we've never failed to finish everything, except the oshibori(the hot towel), of course. The Hamachi at Komasa is usually very good, and tonight was no exception. The Tai was also very good. I'd say the Maguro was decent to good, though a little lower in grade then usual. The Hirame was a bit on the dry side. I usually enjoy my nigiri sushi with just the barest touch of soy sauce, so I can truly appreciate(or not) the texture and flavors. According to the Missus, the Albacore nigiri was every bit as good as the Sashimi. Why order more Albacore you may ask? The Missus enjoys the rice, grated ginger, and green onions on the nigiri, and heck it's (one of) Her night(s). Quite filling and rich, and full of contrasting textures. I ate one piece and was stuffed. 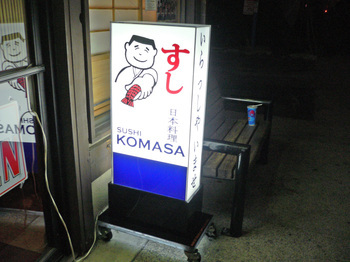 We left Komasa satisfied, until our next visit, which will probably be quite soon. Komasa serves up good sushi at decent prices, we demolished everything, and our bill came out to about $70. Though I really love the Sashimi at Sushi Gen, I prefer the Nigiri Sushi at Komasa. Sushi Komasa also seems to be getting much more popular with Los Angeles Food Bloggers, recently Pam from Daily Gluttony also visited Sushi Komasa, as did Jeni from Oishii Eats, please check out their posts. Tomorrow it's back to San Diego!! hey, if you're ever in the mood for tempura, check out Usui on First St., they have a pretty decent menu and prices.. the tempura is usually pretty solid, better than most places i've had anywhere in L.A.
Wow, this looks fantastic! I love monkfish liver, but I've only had it a couple of times. That looks like a very generous and decadent portion. Lord that looks good! I have a question (pardon my ignorance), what is the white, outer layer on the albacore? Is that fat? Kirk, please try Sushi Nozawa. Pricey. But excellent value for excellent quality of fish. Hey DCCF - Thanks for the rec! Chanko Nabe! Just what this sumo wrestler in traning needs for some nourishment.....actually, I think the Missus would love it! Hi Howie - The Ankimo at Komasa is pretty consistent. Hi Ted - So sorry, I guess that does look a bit different. 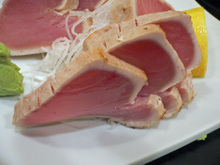 The exterior of the Albacore is "seared", usually by a blowtorch, and the fish immediately placed in ice water to change the texture and seal in the juices. 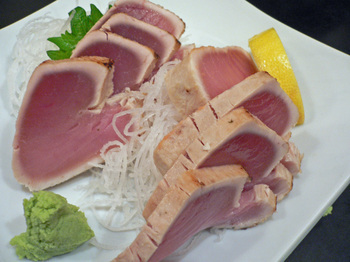 Albacore can be a very dry and flavorless fish, so this process makes the dish more interesting to your palate. Hi Amanda - Thanks. I hope your "move" went smoothly! Hi Joanna - Thanks for the recommendation. 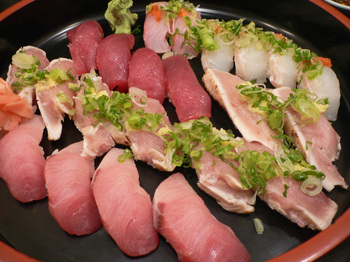 Sushi Nozawa is on my list; and we'll make sure to drop by if we're in the area. I have been in a major need of a sushi fix and this isn't helping. This past week, everytime I have suggested it I have gotten shot down for something else. Hi nhbilly - Thanks, got it! It's on my "list" of the OC! Hi Kristy - It was just a quick-strike sushi visit. Make to give MS our most delici-yoso regards! Hey Jack - Shot down, that;s criminal. Oh, I'll have to remember this one for when I move back to LA. I love sushi. Hi Kady - Oh, there are soooo many good sushi choices in LA. Komasa is good "old school" sushi. Hi Keri - I'm glad you're feeling better. Komasa is a good, dependable, and not overly expensive little restaurant.